After stringing for the Bryan brothers for years at the Indian Wells Tennis Garden, and getting to know their coach, David Macpherson, I landed the stringing franchise for San Diego’s WTT team, the San Diego Aviators. Here, I’m up early the morning before the match in my mobile pro shop. 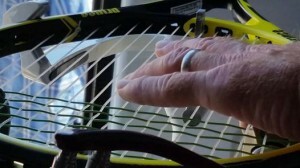 Mike Bryan’s racquet, shown here, is at 44.5/41.5 lbs. Bob Bryan’s racquets are next, along with Somdev Devvarman, Raven Klaasen, Daniela Hantuchova, and Kveta Peschke. The visiting team’s racquets are after that. Tonight’s semifinal playoff opponent is the Springfield Lasers, including Michael Russel, Ross Hutchins, Olga Govortsova, and Anna-Lena Groenfeld. Come on out and support the home team. Match starts at 7pm at the San Diego Sports Arena/Valley View Casino Center.